“Tunde! Afar na.” Seun asked. “Seun, I just dey where I dey o,” Tunde replied. Nigeria’s biggest online marketplace celebrates its 6th anniversary. 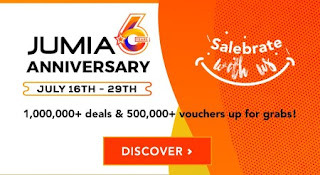 Jumia anniversary has always been an event Nigerians and Africans at large, are excited about as you get to see amazing offers of your favorite brands. Alot of discounted sales are available on this platform. An event hosted by Jumia to say ‘thank you’ to millions of Africans to using their platform. Not only that, you’ve also got the opportunity to buy that smartphone and electronics you always wanted for lesser prices. When Is The Jumia 6th Anniversary Kicking Off? 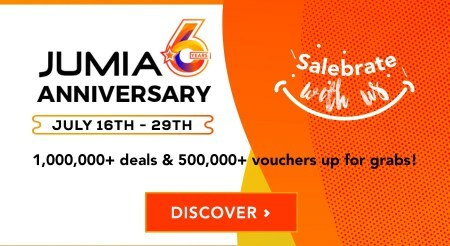 The Jumia 6th Anniversary kicks off at 12:00 a.m on July 16th to July 29th. At your house. House? Sort off. Just visit Jumia.com on your smartphone. There are tips you could use to enjoy even more discounts if you continue reading. How Do I Enjoy These Special Offers? Use Jumia Pay at checkout to enjoy extra 5% off on all orders. Okay guys… now your turn… What do you think of Jumia Anniversary? It’s their 6th anniversary, do you think they can continue doing this? This is the very important one, Don’t they record losses on this discounts?